Amid allegations and counter allegations, it is still unclear who instigated the Bhima-Koregaon clash that sent ripples of violence and rioting across Maharashtra but the political reactions to the unfortunate incident points to a disturbing road ahead as the country hurtles towards the 2019 general elections. It now seems certain that the caste-division formula that we saw during the Gujarat Assembly elections will be increasingly replicated elsewhere as BJP’s political rivals try to find a way to fracture the Hindu votebank. The odds for such a possibility are extremely high because on the one hand we have upper-caste anxiety resulting in aggressive demand for a share of the reservation pie and on the other, a rising Dalit assertiveness that feeds on decades of social oppression. At two ends of the social circle, both these churnings ironically draw from the same resentment — the government’s failure to mitigate the agrarian crisis or create employment for millions of youths. The Opposition, which has been struggling to cope with BJP’s aggressive rise and expansion of national footprint, sees in this adversity a chance to fracture the polity and halt the Narendra Modi juggernaut. Caste fault lines have always existed. In 2014, Modi had been able to paper over the cracks through his campaign of hope. That hope is receding fast, reality is setting in and the fault lines are regaining prominence. All it needs for this cauldron to burst in flames is a trigger of resentment and the Opposition, led by the Congress, has lately been trying to do just that. Congress president Rahul Gandhi’s tweet — posted shortly after reports emerged of violence spreading from Pune to different parts of Maharashtra and angry Dalit youth hitting the streets – is a callous and dangerous statement that laid bare the party strategy. Even as one Maratha youth died, a 35-year-old police constable suffered grievous eye injury, curfew was imposed in some parts, 187 government buses along with dozens and dozens of other private vehicles suffered damages, trains stopped on tracks and shops and commercial establishment downed shutters, Rahul Gandhi saw in the violence a “potent symbol of resistance”. Instead of displaying a modicum of responsible behaviour as the president of India’s grand old party, Rahul’s tweet was an effort to keep alive the rifts that he hopes would bring political dividends. This wasn’t an isolated effort. Members of his party started issuing similar statements, as did some Opposition leaders. 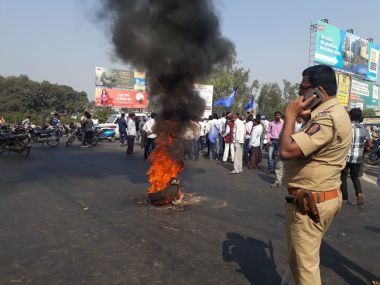 Monday’s incident at Bhima-Koregaon and adjacent villages in Pune is now under a judicial probe by a “sitting judge” but a blame game is already under way with repercussions being felt on Wednesday in the Parliament. Two local Hindu right-wing leaders — Milind Ekbote of Hindu Ekta Aghadi and Sambhaji Bhide of Shiv Pratisthan – have been booked by the police for instigating violence. A counter-complaint has also been filed against Dalit leader and Gujarat MLA Jignesh Mevani and JNU student Umar Khalid — both invited at the bicentenary celebration of Bhima-Koregaon battle — for inciting the crowd. The police complaint against Mevani states that the Gujarat Dalit leader told “people to come on street and retaliate” that resulted in tension erupting between the two communities. While the truth behind allegations will eventually emerge – and it is entirely possible that right-wing groups were indeed behind the clash — it seems odd that RSS or the BJP would actively instigate division between Hindu communities that defeats its stated purpose of ‘one India’. If anything, a fracturing of the Hindu vote bank immensely benefits its rivals and unless the BJP is on a suicide mission, it makes no sense for the party to drive a wedge between Dalits and the Marathas. To increase voter base and pitch it as a ‘pro-poor party’, Amit Shah and Modi have been trying vehemently to rid BJP of its ‘bania-trader-upper-caste’ moorings and spring ‘development’ as a plank to cement the fault lines. It had paid handsome dividends in the past. It is unclear why BJP would suddenly reverse its efforts and court trouble in an election year. Expectedly, BJP leaders have been circumspect, issuing statements to control the damage. Conversely, Gujarat experiment has convinced the Congress that it can benefit from a laser focus on caste equations and break into the BJP vote bank. A News18 report quotes a post-Gujarat Lokniti study to show that “36 percent of the Patel votes went to Congress this time” as opposed to 10 percent in 2012. “The most number of votes from the community – 46 percent – came from Leuva Patels. This is a 31 percent increase from what the party got in 2012 state elections when only 15 percent of the Leuva Patels had voted for the Congress.” The party also received 27 percent Kadwa Patel votes, an 18 percent increase compared to 9 percent in 2012. It also registered an uptick in OBC votes.